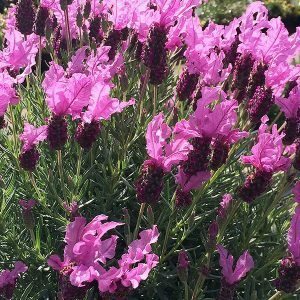 One of the very best pink flowering Lavenders is ‘The Princess’ Lavender. What makes this plant so good is that it easy to grow, easy to prune and hase simply magnificent flowers. A two year old plant can make a feature plant in the garden by itself. 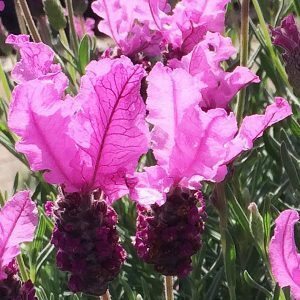 When in full flower The Princess Lavender is covered with masses deep purple flowers topped by large bright pink flower bracts, all held well above the good grey to green foliage. The plant is fragrant, attracts bees and butterflies to the garden and grows well in containers as well as in the garden. Use it as a low growing hedge, or plant it in groups of 3 – 5 for a mass display. Flowering will commence in spring, spot flowers through summer into autumn are common. especially if you give it a light prune after the first flush of flowers and provide a little extra water over summer. After planting, water in well with a liquid seaweed fertiliser. Mulch around the plant to maintain a cool moist root run. Prune immediately after the first flush of flowers to encourage more flowers through the season. Prune again later in the season by 1/3 to 1/2, never pruning back onto old wood. Always prune back so good foliage is still present on each stem. Do not prune back into old wood. We have also pruned this plant in late winter, this did delay flowering by about 6 weeks, however the plant bounced back beautifully with masses of flowers. Spread – Will spread to around .4 metres. Foliage – Mid grey green..